Metamorphosis 1 presents the work of 50 contemporary Surreal, Fantastic & Visionary Artists. 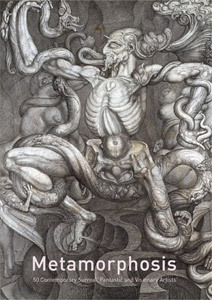 By publishing the work of established artists such as Ernst Fuchs, Alex Grey, Victor Safonkin, Andrew Gonzalez, Martina Hoffmann, Laurie Lipton, Chet Zar, Kris Kuksi and Robert Venosa alongside that of relatively unknown � though extraordinary � artists, we have aimed to bring a host of new artists into the public eye. Metamorphosis 2 is also available. Metamorphosis 1 is a limited edition hard cover art book with 108 A4 pages and 122 plates.